Trainer Summit Nov 22 & 23! Register Today! Posted July 19th, 2018 by Crisis Centre & filed under News. 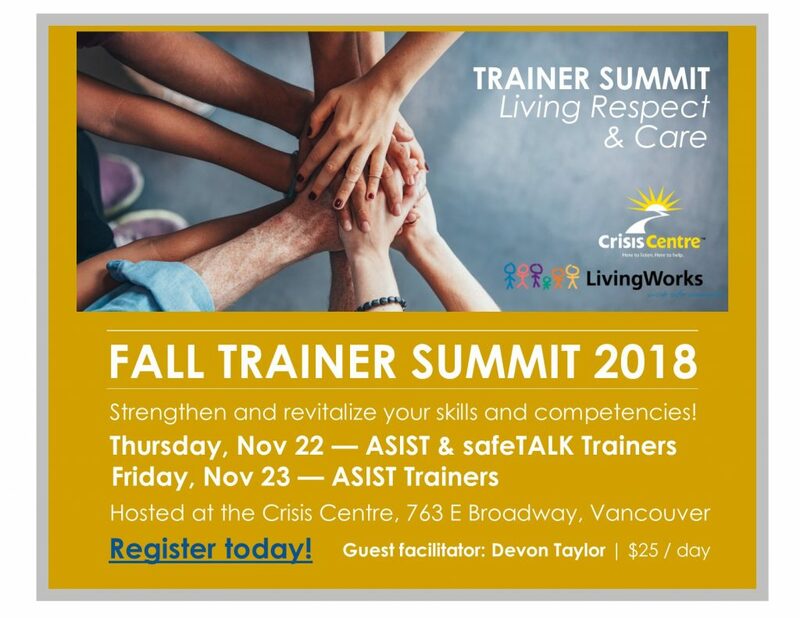 The Crisis Centre is hosting a 2-day Trainer Summit November 22 & 23 at our Vancouver office for ASIST and safeTALK trainers. Revitalize and strengthen your trainer skills and competencies while supporting our trainer network in BC! Our theme is Living Respect and Care. Together we’ll explore the various ways trainers bring to life these essential watch-words: with standard procedures, participants in diverse contexts, training teams, and for ourselves. We welcome Devon Taylor, Trainer Support and Quality Assurance Team Leader as our guest facilitator. Register online today! Space is limited, we encourage early registration. Morning: Keynote address by Devon Taylor, with plenty of opportunity for learning, networking and discussion among trainers. Afternoon: Coaching specific sections of the workshop. ReSet* with Devon Taylor. ASIST trainers will refresh themselves in this interactive, engaging, and collaborative opportunity to explore and revisit the underlying reasons for standards and support them in strengthening our training practice. Morning refreshments and lunch are provided. Opportunity for social engagement on Thursday, Nov 22nd. This event is possible thanks to a grant received by Living Works. We are offering free enrollment in our 8-week Online Mindfulness Program for all registered participants (course starts in 2019), plus the opportunity to take suicide to Hope for $35 on Wednesday, Nov 21st. *About ReSet: The ReSet is a trainer support tool that is consistent with the design and delivery of all LivingWorks’ programs. A one-day workshop for active A11 trainers focuses on re-establishing and deepening an understanding of standard procedures. The ReSets interactive, engaging, and collaborative. Its purpose is to help trainers explore and revisit the underlying reasons for standards and support them in strengthening their own training practice and reviewing any possible drift from those standards.